Shop USPS approved mailboxes and private use mail boxes – for commercial or residential properties – for sale online from U.S. Mail Supply. We offer big and small heavy duty locking metal indoor and outdoor mailboxes for all sorts of different purposes: for apartments, schools, military bases, government buildings and even regular residential homes. Metal mailboxes are also an ideal solution for large and small businesses, offering extended durability, security and storage in an office or open commercial environment. Shop USPS approved and private use pedestal, surface mount or recess wall mount mailboxes for small businesses and companies. Choose decorative vintage style apartment cluster mailboxes for high end luxury complexes. 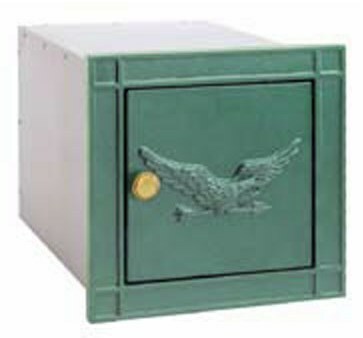 Buy USPS approved 4C horizontal mailboxes and 4C pedestal mailboxes available for sale online from U.S. Mail Supply. 4C mailboxes provide exceptional security and customization options, including outgoing mail slots and package lockers. Our inventory of commercial mailboxes includes mailboxes pre-approved by the U.S. Postal Service. Installation is made easy in accordance with USPS guidelines. Choose modern style cluster mailboxes for an apartment complex, or Victorian style elegant decorative cluster mail box units for luxury apartment complexes. Hundreds of door/slot combinations available. Shop outdoor cluster mailbox systems perfect for commercial properties like apartments, condos, businesses, government buildings or military bases. Metal pedestal mailboxes stand tough against harsh Tennessee weather. Buy indoor vertical and horizontal mailboxes for USPS delivery or private use. We offer deep customization options for horizontal mailboxes. Upgrade your ancient crumbling residential mailbox(es) to a new metal wall mount mail house or traditional locking box with post attachment. 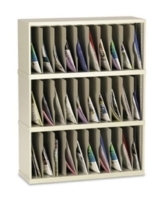 Shop mail sorters and literature organizers for mailrooms, classrooms, offices, or any business environment where you’re in need of document organization. Forget the cheap stuff. Metal mailboxes are built to last. 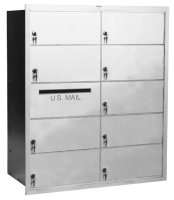 Surface mount and recess wall mount metal mailboxes from U.S. Mail Supply are built tough with aluminum and steel to provide longevity and long-term strength against the elements and heavy use. Outdoor pedestal cluster mailboxes stand tough against the test of time and give you peace of mind knowing property is stored in a safe, lockable and secure metal mailbox. You’re best off getting a quote for custom mailboxes built to your exact specs. Depending on your available space, you could take many different directions. Choose your desired door count, package lockers, outgoing slots, rear or front loading option or intention for public or private delivery. We’ll help you find the perfect mailbox for your application.